Overall, most caregivers report substantial positive aspects (67%) and little or no negative aspects (62.5%). More than two in three report that caregiving brought them closer to the care-recipient, and 86.3% report caregiving provides satisfaction that the recipient is well cared for. Only about one in ten caregivers report substantial negative aspects of caregiving, the most common being having more to do than they can handle (17%), feeling exhausted (16%), and not having time for themselves (15%). Most caregivers also reported no difficulty with caregiving, and only about 14% reported substantial financial or physical difficulties. Slightly more than one in four, however, reported emotional difficulty as a result of their caregiving. Patterns were similar for caregivers helping with self-care or mobility, although they appear to be slightly less likely to report few gains and more likely to report substantial negative aspects of caregiving and difficulties with caregiving. The apparent differences are not statistically significant, however, although self-care and mobility helpers were significantly less likely to report no financial, emotional, or physical difficulties. Daughters, caregivers age 45-54, and those who worked for pay 20 or fewer hours per week or 40 hours per week, were most likely to report substantial negative aspects of caregiving (Table 6). Generally, for all caregivers and among non-spouse caregivers, those providing self-care or mobility assistance appeared to be marginally more likely to report substantial negative aspects and marginally less likely to report few gains, although differences were not statistically significant. This pattern may suggest, however, that both rewards and burdens are associated with greater engagement in caregiving. Relationship to care-recipient also appears to be important in the balance of gains and burdens. Non-relative caregivers, who, as seen in Table 2, provided the lowest hours of care on average, were more likely than related caregivers to report little or no gains from caregiving but also less likely to report substantial negative aspects, even when they were providing self-care or mobility assistance. SOURCE: Data from the baseline 2011 NHATS and the companion NSOC. Of the full sample of 2007 informal caregivers, 11 who reported helping in the last year, but not the last month are excluded. a Scale from 0-8 summing individual gains or negative aspects after recoding each item to 0-2, with 0 representing the lowest and 2 the highest. Factor analysis indicated that gains and negative aspects of caregiving represented 2 factors: alpha=0.70 for gains from caregiving and alpha=0.75 for negative aspects. Categories for scales are 0-2: little or none; 3-5: some; 6-8: substantial. b For difficulty items, respondents are asked whether they have any difficulty and, if yes, to provide a level from 1-5 with 1 being a little difficulty and 5 being a lot of difficulty. Categories in the table are defined as 0: none; 1-2: some, and 3-5: substantial. 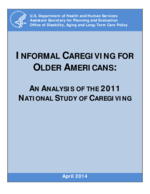 **(*) Significantly different from value for all caregivers at the 5%(10%) level in a two-tailed test. The balance of positive and negative aspects of caregiving differs across groups in interesting ways. For example, those ages 45-54 were most likely to report substantial negative aspects of caregiving, but they also were least likely to report little or no gains. Among non-spouse working caregivers, those working 20 or fewer hours per week also had a higher than average likelihood of reporting substantial negative aspects of caregiving but were less likely than average to report little or no gains, even if they were providing self-care or mobility assistance. SOURCE: Data from the baseline 2011 NHATS and the companion NSOC. NHATS functional level is taken from the NHATS. Hours of care and caregiver characteristics are taken from the NSOC. N=1996 NSOC respondents who provided care in the month prior to interview. Care-recipient characteristics appear to be far more important than informal caregiver characteristics in whether caregivers perceive substantial negative aspects of caregiving (Table 7). Among all caregivers, caregivers to recipients who report assistance with 3+ self-care or mobility tasks are more than twice as likely to report substantial negative aspects as those helping recipients who report receiving assistance with only household activities (14.4% vs. 5.9%). Nearly one in five caregivers assisting recipients who have probable dementia report substantial negative aspects, about three times the proportion among caregivers assisting recipients with no dementia. Among caregivers assisting with self-care or mobility activities, those caring for recipients with dementia also are twice as likely to report little or no gains from caregiving (8% vs. 4%). Among self-care or mobility caregivers, those assisting recipients in supportive care settings are half as likely as others to report little or no gains from caregiving. SOURCE: Data from the baseline 2011 NHATS and the companion NSOC. NHATS functional level is taken from the NHATS. Hours of care and caregiver characteristics are taken from the NSOC. Of the full sample of 2007 informal caregivers, 11 who reported helping in the last year, but not the last month are excluded. ††(†) Significantly different from the value for no dementia at the 5%(10%) level in a two-tailed test. ‡‡(‡) Significantly different from the value for no self-care or mobility at the 5%(10%) level in a two-tailed test. Health of the informal caregiver also is very important in perception of substantial negative effects of caregiving (Table 8), although it is not possible in cross-sectional analysis to parse the inter-relationships between the two. As was seen for other caregiver characteristics in Table 6, the proportion reporting little or no gains from caregiving is relatively invariant by health. One in five caregivers report fair or poor health, and another nearly three in ten report good health. These caregivers are four times and three times as likely, respectively, as those in excellent health to report experiencing substantial negative aspects of caregiving. Sleep problems affect more than four in ten caregivers and are associated with a three-fold higher likelihood of reporting substantial negative aspects of caregiving. Depression and anxiety affect about 13% of all caregivers and 15% of those assisting with self-care or mobility and are associated with the highest reported rates of substantial negative aspects of caregiving (25.8%-28.6% and 27.5%-30.3%, respectively). The most prevalent symptoms and impairments are pain, weakness in upper or lower extremities, and low energy or exhaustion to the point of limiting activities, all of which are associated with significantly elevated rates of experiencing substantial negative aspects of caregiving. Activity limitation because of breathing problems is uncommon, but about one in five caregivers experiencing limitation from this impairment report substantial negative aspects of caregiving.